The SPF 20 Illuskin Aquaboost The ONE Foundation is an ultra-light, medium coverage base that invigorates the complexion with natural luminosity and incredible hydration. Its magnificently smooth formula with Gel Technology, enriched with Active Natural Glacier Water and FPS 20, leaves the skin looking radiant * and hydrated up to 8 hours *. FPS protection 20. * Tested by 65 women. Apply base points on the center of the forehead, nose, chin and cheekbones. Use the base brush or the tip of the fingers to spread the product from the center of the face outward until a uniform finish is achieved. Always start with less foundation than you think you need, and add more as needed. 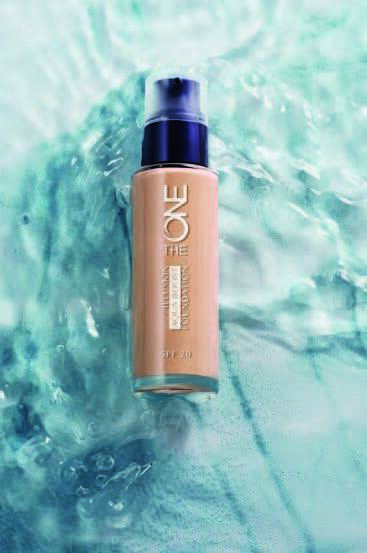 Formulated with GEL TECHNOLOGY, enriched with NATURAL ACTIVE GLACIER WATER , and FPS 20 . Gel Technology combines the intense hydration of an oil and the freshness of the water. This technology allows the formula to spread gently and be absorbed quickly, giving a refreshing sensation of pure hydration. An asset based on the Pure Water of the Swiss Glaciers, naturally rich in mineral trace elements, accumulated when water infiltrates the rocks and rocks of the Alps. Natural Active Glacier Water is created through the encapsulation of water into liposomes, barrier-like structures that protect the water and help penetrate and confer lasting moisture to the skin. As well as a supreme moisturizing and soothing properties, Active Natural Glacier Water protects skin cells from damage caused by heat ◊ . SPF 20 protection against photoaging. ◊ Ingredient tested in vitro.